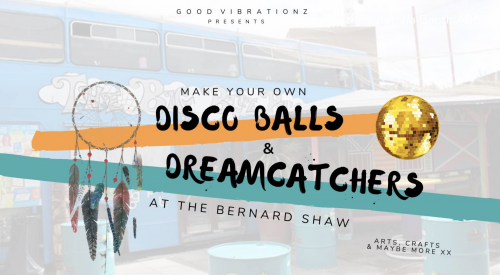 Good Vibrations are doing a workshop on making dream catchers and mini disco balls here at The Shaw. The event is free and all are welcome but get here early as we always fill up. There will be some funky beats provided by Manma Saor, pizzas available from the Big Blue Bus and drink deals to kick off your Saturday. The event is all about connecting people through the arts – come alone or with friends and meet some new people. Otta the dalmation will also be here for all your cuddling needs.